When one looks into the history of the trumpet during the Medieval Ages, it is sometimes difficult to observe the musical reasoning for its preservation throughout various cultures. Since all things do not exist without a history, it is important to research the forerunners of today’s trumpet to find its true importance and reason for survival. Medieval trumpets were very diverse in both composition and sound. Readily available materials may have been the determining factor in certain countries for their existence. Animal horn, wood and metal trumpets have been evidenced in various historical data from the Medieval Ages (Grout). The buccina typically described the medieval trumpet that was made of straight, jointed metal pieces (Munrow). When assembled, the buisine (latin, buccina) formed an instrument that was over six feet long. Used for ceremonial purposes, the buisine has been documented to have had standards attached to its tubing (Munrow). The effect was an appearance of regal nobility. Metal trumpets of smaller size were given the name clarion during the Medieval Ages. (This name corresponds to higher-pitched instrument ranges, i.e. the clarinet’s clarion register.) It is this useful, higher pitch that was benefical for military function; the pitch was loud and bright enough to be heard over many miles. Consequently, the smallness of the instrument was also advantageous to the necessary travel made by military musicians. Buccina and clarion trumpets were found in the regions of England, and France. They most likely appeared in other areas of Europe, however, concrete documentation for this supposition does not exist. 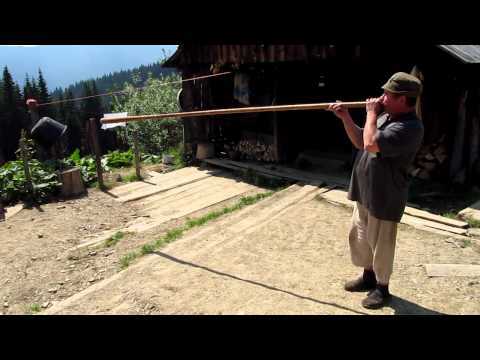 The Roman cornu, or ram’s horn, was another form of the medieval trumpet in use throughout the Orient, and Europe during the Medieval Ages. With its main uses found in a military or ceremonial vain, the sound of this trumpet form was very unique. Its loud and braying sound (HDM) quickly aroused the attention of people within the area to take note of a military or domestic problem within the watch of the tower guards. Specific combinations and duration of pitches signaled the citizens to respond with appropriate defence procedures and actions. The musician was integral to accessing pitch on the Medieval trumpets. With the sound being produced by the lips against the aperture of the horn, only notes within the harmonic series of that particular horn was available. As far as history had been documented, it is noted that keys and finger holes were not used until at least the 15th century. This lack of pitch availability demanded much embouchure. If a musician needed to get a series of sequential whole-tone pitches, a number of different horns, and sometimes musicians, had been used. With the passing of time and the desire for creative musical function, the Medieval trumpet was altered with various combinations of finger holes and mouthpieces. Although far from full development, these alterations would provide the impetus for the future functional trumpets that would be modified fundamentally in the coming Renaissance period. “Brass Instruments.” Harvard Dictionary of Music. 2nd ed. 1944. Grout, Donald and Claude Palisca. A History of Western Music. 5th ed. New York: Norton, 1996. Munrow, David. Instruments of the Middle Ages and Renaissance. London: Oxford UP, 1976. The Renaissance was a time of drastic change in the fundamental inter-workings of the trumpet. The evolution of the trumpet had diverged into two main groups: horns made of metal and horns made of wood using finger holes. The metal trumpet (specifically the clareta, or natural trumpet) will be of primary focus here. The clareta was inspired by its predecessor, the Medieval trumpet. Keeping a Medieval concept of metal composition, the clareta’s sound was improved by increased precision of metal workmanship and its metal alloy composition. Using new capabilities to curve hollowed metal without altering the inner shape of its bore, air produced by the clareta performer was able to flow freely through the instrument’s chamber without obstruction. This advancement produced a clearer sonority and the ability for the performer to obtain the upper harmonics because of the more resonant fundamental pitch. During this period, the common range of the metal Renaissance trumpet was C below middle C to G’’. Clareta performers were known for their incredible virtuoso playing in the upper extensions by performing up to an F’’’ (Munrow). Understanding the usefulness of the brass flare at the end of the instrument, Renaissance trumpet makers, such as Neuschel of Nuremburg, created a smaller, although more efficient flare at the end of the trumpet. This thickened flare continued to improve upon the brightness and articulate sound of the Renaissance trumpet (ASW). With its tightly wound, S-shaped tubing, air was expelled faster because of the “exponential” (Monrow) curvature. Common metal, such as silver and brass, also became determinants in the brightness and clarity of sound. Continuing to be used for ceremonial fanfare, the clareta was also utilized in civic life. The instrument became more common in weddings, public courts and by composers. Monteverdi’s Toccata in Orfeo (1607) calls for a “clarino” which was a high pitched trumpet that was built in the key of D. With the use of Renaissance mutes, the dynamic range was decreased and the sound was brought down a whole step to the key of C.
With the usefulness of the upper harmonic pitches, the clareta became an instrument useful for polyphonic performance. As exemplified by Girolamo Fantini’s Modo per Imparare a sonare di tromba (1638), exercise books were written to develop the Renaissance trumpet player’s technique. The Renaissance trumpet had become an instrument that was on the rise to its great virtuoso usage as documented in the Baroque period.